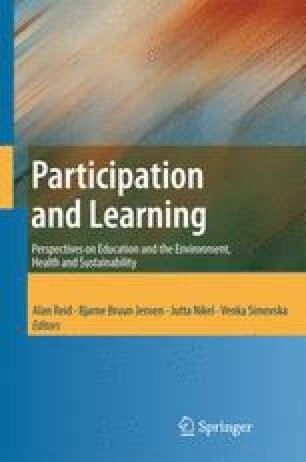 Drawing on theoretical discussion and the vitality of an empirically-based case study, this chapter documents, explores, and reflects on processes of learning about health through participation and action. The study is positioned within the democratic health-promoting schools tradition which emphasises a critical approach to the issue of student participation and the importance of taking action as part of learning about health. The chapter begins with discussion of the health-promoting schools initiative in Europe as exemplified by the European Network of the Health Promoting Schools, the position of the concept of participation within the frames of the health-promoting schools approach, and its implications for the ways we look at learning. Then, a model distinguishing two different qualities of participation, (token and genuine), is considered.